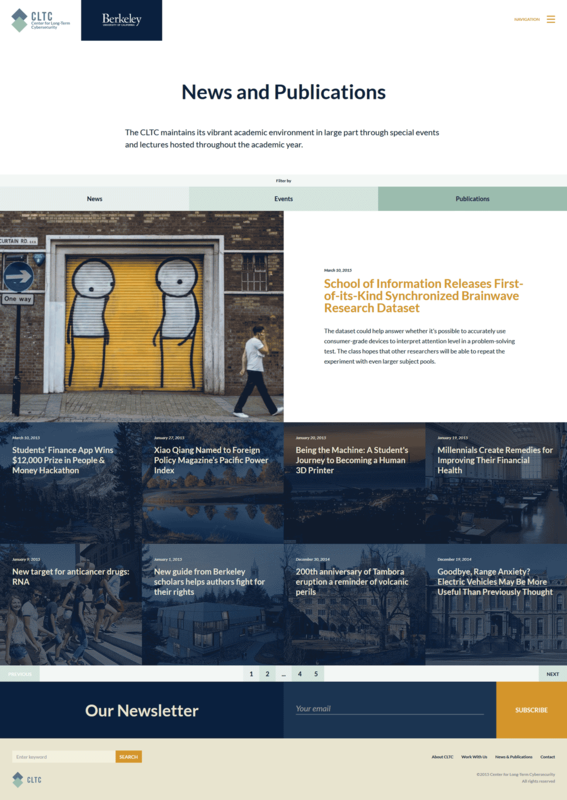 UC Berkeley's new research and collaboration hub dealing with the security in digital age. 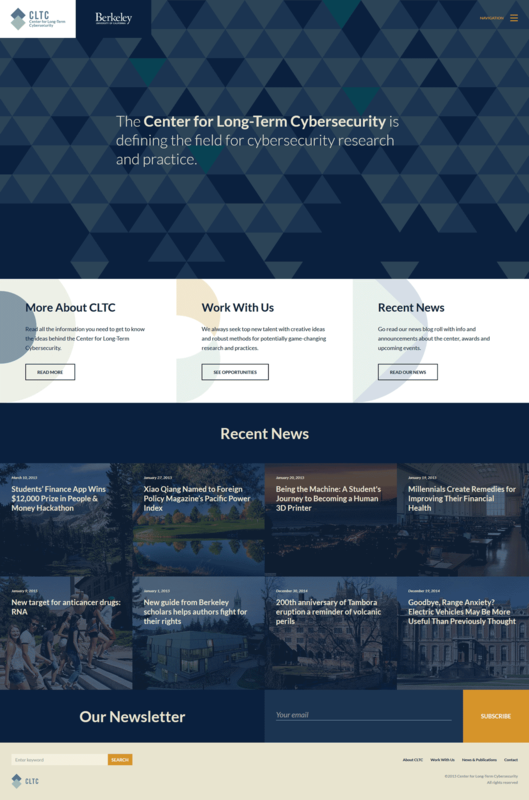 From research, training, and grants to issuing policy recommendations for the White House administration and the House of Representatives, Center for Long-Term Cybersecurity deals with issues that bear on security wherever humans and digital machines interact. 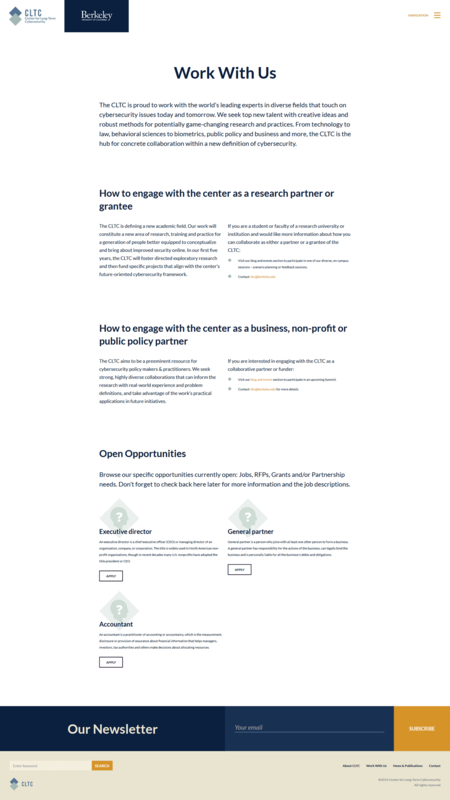 When a new center was opening at Berkeley I got a pleasure of creating its digital dwelling online as well as developing overall visual persona for the organization from logo to website in line with the UC Berkeley brand and research culture. 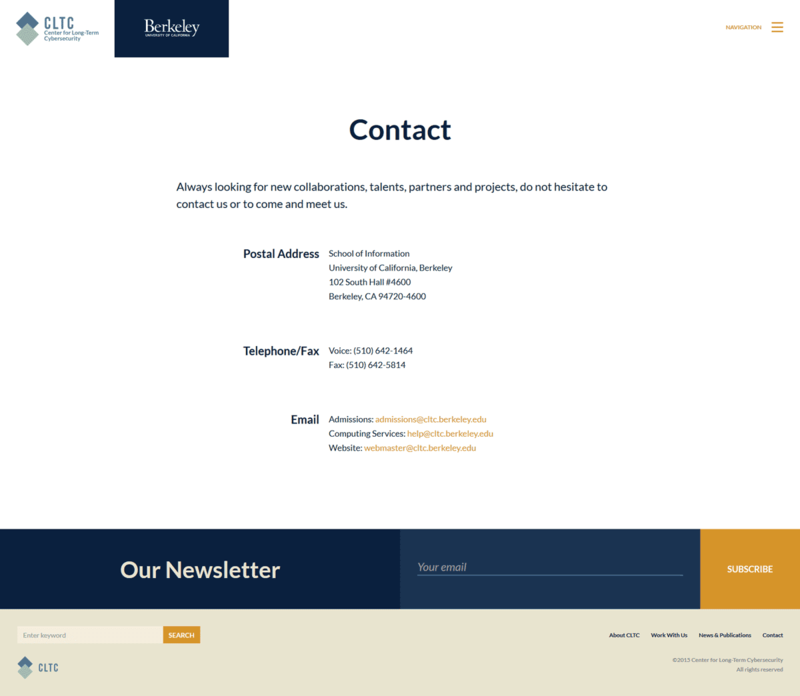 The site was developed from scratch starting with information architecture and finishing with handout to the client team. The scheme was based on the slightly modified Berkeley's brand guidelines to retain recognition of the Center. The tone selected was somber. As client would put it "modern gravitas — accessible and open but not too friendly". Creating a logo was the first thing to do. This gave me an ability to try things out in terms of design direction and tone before venturing into the main project. I created quite a few variants to consider, some of them were quite gaudy to be honest but hey, sometimes even the weirdest stuff grows on you eventually. I could've written a couple dozens of pages filled with guidelines, golden ratios and meaninglessful phrases a-la infamous Pepsi's "Breathtaking Design Strategy" document, but the truth it we just simplified and simplified the graphics until there was almost nothing left but literally two pixels of data — it did appeal to all interested parties so here we are. The very first ventures of the young organization into the world were conferences and meetings with the high ranking officials. It was required to have some good old paper presentations to pass around at those. One of the main theses of the Center was called "At the intersection of humans and machines" and the main illustration was settled upon quickly. The famous hands of God and man by Michelangelo was used as an inspiration. Not the most original idea but it did the job. The main site was to be pretty straightforward in terms of functionality with the news section being the most important part of it. 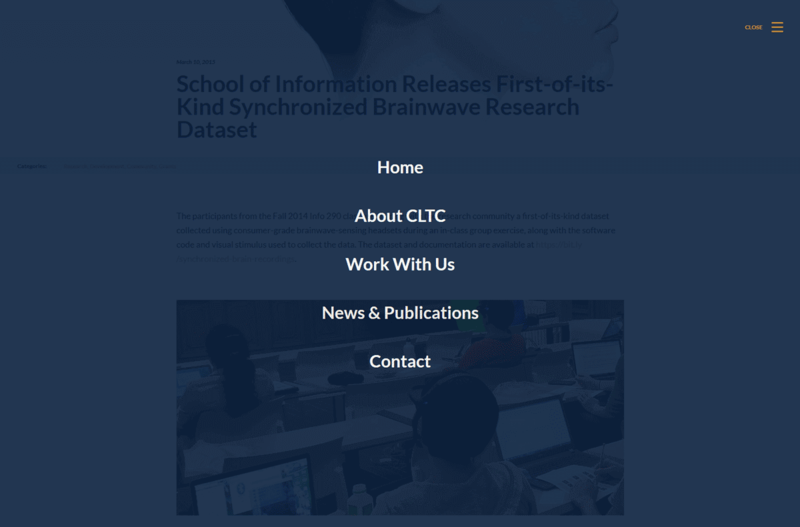 It had to be easy to read and navigate, with plenty of white space for comfortable articles reading, and no less importantly, modular and easy to update in the future. With the visual direction, which was established during the first stages, the website was built in a short span of time. The site is currently updated, upgraded as necessary, and populated by the client's in-house team. But wait, let us talk about your project now! During this dozen of years I've seen things young designers wouldn't believe. Grunge and web2.0 on the rise at the beginning of 00s. I watched first responsive sites glitter in the static dark near the start of 10s, and first UX-centric approaches emerging in recent years. I've seen skeuomorphism die. All those moments will not be lost in time. Hi, I'm Alex. For many years I've been in the process of improving the digital realm around me (and improving myself at the same time) in a couple of ways I could. Mostly by giving it a meaningful look, providing the cues to not get lost in it, and ensuring I am not getting carried away by the visual side of the job. Mind you the last part is the hardest one. I am always happy to dirty my hands on a complex task, so do not hesitate to hit me up with your requests! And if your project will benefit the humanity in any meaningful way I will make a 50% discount right away. No kidding.